LONDON--(BUSINESS WIRE)--Technavio analysts forecast the global airport information systems market to grow at a CAGR of almost 6% during the forecast period, according to their latest report. The research study covers the present scenario and growth prospects of the global airport information systems market for 2017-2021. Technavio presents a detailed picture of the market by way of study, synthesis, and summation of data from multiple sources. Airports are increasingly embracing technological solutions to achieve operational efficiency and associated cost reduction. As a result, the authorities are investing in new technologies such as geolocation, near-field communications, iBeacons, 3D face recognition, video analytics, and thermal sensors. Operational systems form the key leading segment of global airport IT spending. This report is available at a USD 1,000 discount for a limited time only: View market snapshot before purchasing. With the introduction of airport display systems such as FIDS and passenger infotainment systems, reduction in the operational expenses of airports has become possible. The adoption of these systems reduces the manpower required at airports, decreasing the need to maintain many human resources. A number of versatile technologies are being developed that promote interactivity. Telecommunication technologies are constantly evolving, resulting in better and more efficient services. The market thrives on network availability; thus, telecommunication technologies play an important role in the growth of the airport display systems market. “Due to the introduction of 4G and long-term evolution technologies, airport operators are now able to provide better connectivity, improving the quality of customer service. Better connectivity to the network is the sole requirement of this market as passengers use the services provided by airports to enquire about flight arrivals, departures, and other flight-related queries,” adds Avimanyu. The smart airport program, a joint initiative of International Air Transport Association (IATA) and Airports Council International (ACI), has been designed to boost the efficiency and profitability of airports even during volatile economic conditions. Such airport terminals are developed around a single, converged internet protocol platform that enables high-speed broadband traffic across the aerodrome. Obtaining new operation slots at busy airports is difficult for airline operators and often involves a significant cost. Effective airport operations management through state-of-the-art airport information systems can enable more airlines and aircraft to operate in the same slots and with the same resources. Become a Technavio Insights member and access all three of these reports for a fraction of their original cost. As a Technavio Insights member, you will have immediate access to new reports as they’re published in addition to all 6,000+ existing reports covering segments like defense, space, and aerospace products. This subscription nets you thousands in savings, while staying connected to Technavio’s constant transforming research library, helping you make informed business decisions more efficiently. 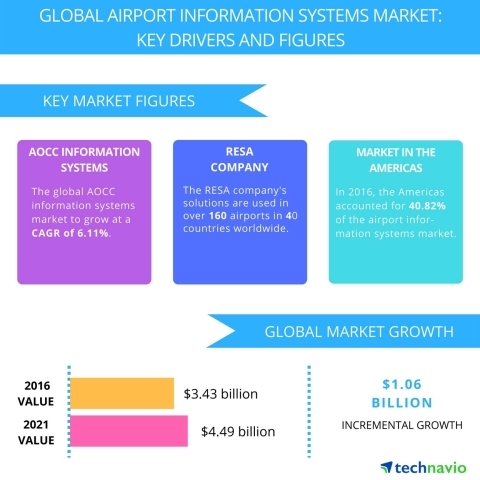 Technavio analysts forecast the global airport information systems market to grow at a CAGR of almost 6% during the forecast period, according to their latest report.